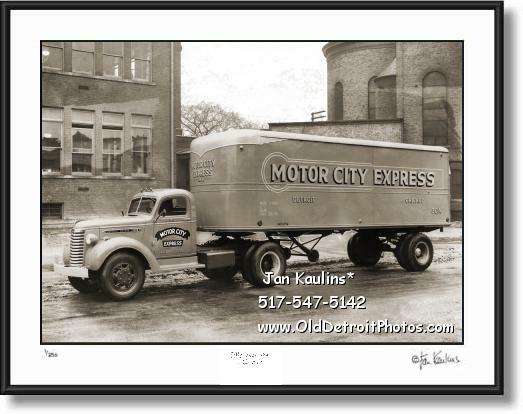 MOTOR CITY EXPRESS FRUEHAUF TRUCKING DETROIT photo picture print photograph for sale. This sepia toned MOTOR CITY EXPRESS Trucking Company of Detroit and Chicago photo print for sale is a fine example of a very early vintage portrait of this historic Fruehauf Trailer and General Motors Truck cab from about the 1940's. This historic Detroit photo shows excellent detail on the truck itself. The Original black and white photo from which this has been made was in 'fair' condition prior to restoration. There is some minor discoloration and texturing on the buildings and on the street not affecting the subject (the truck) at all---just mentioned for the sake of accuracy. . THE ORIGINAL OLD DETROIT BLACK AND WHITE PHOTOGRAPHS HAVE BEEN PROFESSIONALLY RESTORED DIGITALLY BEEN RE-MASTERED AND ALL MAJOR FLAWS, SUCH AS TEARS, SCRACTCHES, MISSING PIECES, FOLDS, INK STAINS ETC. ON THESE RARE PHOTOS HAVE BEEN PAINSTAKINGLY REMOVED AND CORRECTED AND HIGH QUALITY PRINTS OF THESE HISTORIC RARE DETROIT BLACK AND WHITE SEPIA TONED PHOTOS ARE NOW OFFERED, FOR THE FIRST TIME, ON THIS WEBSITE WWW.OldDetroitPhotos.COM . THESE OLD DETROIT PHOTOS FOR SALE HAVE BEEN BEAUTIFUL RESTORED AND ARTISTICALLY SEPIA TONED AND OFFERED IN A LIMITED EDITION OF INDIVIDUALLY PRINTED PHOTO PRINTS. THEY ARE READY FOR DISPLAY IN YOUR HOME OR OFFICE. HERE IS YOUR CHANCE TO OWN AND ENJOY SOME VERY SPECIAL AND UNIQUE DETROIT PHOTOGRAPHIC HISTORY.